← Kickass Anthology Update – we raised over $600! THURSDAY MORNING COFFEE – Snowflake Cookies, recipe included. I’m flooded with requests for both recipes and technique in response to my snowflake cookie photo. People, if you can dedicate 3-4 evenings to cooking and decorating, have a blast! We do one batch every year. That’s all you need to decorate your usual cookie give-away, and there’ll be enough left over to hang on the tree. My Czech heritage brought a Christmas cookie tray into the family, where my Jewish husband expanded it to truly insane levels. This year we had to cut back to only 18 varieties due to time constraints. The two recipes below are from our collection of 50+ cookie recipes, and they work equally well. The Moravian one tastes like gingerbread, whereas the Scandinavian one is more like a fancy Oreo. Of course, baking 1,500 – 3,000 cookies means I need to compensate on the health and nutrition front. We give most of them away. When my daughter Miranda came back from college, she and the younger Eleanore were taking a survey of the brimming cookie tins fragrant with toasted nuts and spices. She was instructed to taste the new salted honey cookie, which she did, but the girls kept sampling the sweets before dinner. “Stop eating those cookies!” I yelled from the kitchen. My eyes were glued on cutting up food, the sharp chef knife sliding through dinner meat with alarming ease. I didn’t bother looking around the corner. “Here, have some fruit!” I grabbed a fat grapefruit with one hand, eyes still on the cutting board. “Catch!” I yelled and threw the heavy fruit in their direction. As though in slow motion, I peeked around to see Miranda turn, meeting the trajectory of the falling grapefruit with shock written over her face. A physical shock of a different variety followed – the yellow grapefruit thudded on the big green tin she was holding just then. The snowflake tin. Time stopped as I dropped the knife, and a very bad word sort of slipped past my lips. We’ve spent hours upon hours rolling out, cutting out, baking and decorating. We clustered around the tin as Miranda pried the misshapen lid off. Yep, it was bad. Bad enough to fess up and own it and not even remind my husband that “You know, dear, how you insist that your girls have to know how to catch and throw?” He took it better than I could’ve expected. A broken snowflake has its own kind of beauty: ephemeral and not intended to last. Enjoy it while you can. One third survived intact, one third suffered grievous dismemberment, and the last third was tossed in the trash. At some point, you just call it a loss and move on. So if you make these, be warned. Don’t use them to catch grapefruits. Break off 1/4 of the dough to roll out directly on parchment and under a plastic wrap. Don’t be afraid to make them thin – they are sturdy. Cut out your basic shapes and remove surrounding dough for reusing later (a knife and a skewer work well.) Bake, slide hot cookies onto a cooling rack while still on the parchment and let cool completely before handling or decorating. Use royal icing for decorating, piped through a small-hole pastry tip. Keep a wire cleaner or a pin handy to clear the tip as needed. Go wild! While the icing is still wet, sprinkle with sanding sugar and edible glitter. Position metallic dragees in strategic areas. A chopstick tipped with a bit of icing gives better control than fingers or tweezers. The recipes, written up by Scott Pavelle (www.pavellelaw.com) are below, as well as a link for a store where you can buy the snowflake cookie cutter we use. These are crisp, molasses-flavored, spice cookie wafers, adapted from a recipe in Bakewise by Shirley Corriher. They are lots of fun because the texture is so unique – especially if you go as overboard as we do and carve them into snowflakes. One recipe makes a LOT of super-thin cookies, between 60 and 120 depending on size. The prep time depends a lot on your rolling skills. It takes a lot of rolling to get the dough thin enough, let alone to carve out snowflakes. Preheat oven to 325°. Line two baking sheets with parchment paper. Combine the 1¼ cups of flour, baking soda, and spices. Mix well to get the baking soda completely distributed, using the spices as a marker to see how well it’s going. Or you can just give it all a quick whirl in the food processor. Cream together the butter/shortening and the sugar. Once it’s light and fluffy, stir in the flour-spice mixture. Heat the molasses until lukewarm and then stir it into the dry ingredients. Mix well, adding water or extra flour as needed to get a rollable consistency. Set aside overnight. NOTE: Large 2½” rounds and hearts work nicely, but we like to go the whole nine yards and cut out snowflake shapes. Bake at 325° for 9-10 minutes. You should end up with a delicately thin, not too sweet, spicy cookie. Cool on the tray for a few minutes to set up, and then transfer to a rack to let them finish. NOTE 2: The cookies are a dark molasses color. Royal icing makes a spectacular counterpoint, especially when highlighted with sanding sugar and silver dragees. Hang them from your tree! NOTE 3: The royal icing can help to reinforce the cookies and make them less fragile. It only works if you pipe out lines, however. Dots are pretty but non-structural. NOTE 4: Moisture from the icing can soften your cookie. 10 or 20 minutes of drying in a 200° oven will fix that. Don’t go higher, though, or the icing may start to brown. Pure butter encourages the cookies to spread, which interferes with the precise carving you want to do. Shortening holds its shape. So, if you’re making simple shapes, go ahead and use butter, but if you’re making snowflakes mix in at least 50% shortening. You ought to be able to find a brand with no trans-fat. In our first batch we accidentally doubled the amount of sugar. The cookies tasted wonderful, but were a bit tougher than the very delicate base recipe. Keep it in mind as a note. Full flavor is fine, but not Blackstrap. That would overwhelm everything else. This is a cookie that Scott came up with in 2013. The dough holds its shape astonishingly well, tastes great (like Oreos), and makes 60-120 wafer thin snowflake cookies depending on size, thickness and laciness. Prep time: Long. It’s a friendly dough to work with, but it still takes forever to make all those tiny cutouts. Combine the flour, baking soda, and spices in a food processor and pulse until you can see that the spices are evenly distributed. (It is actually more important to distribute the baking soda, but the spices serve as a handy indicator). In the bowl of a stand mixer fitted with the paddle blade, cream the butter and the sugars together until it is light and fluffy, ≈ 2-3 minutes. Beat in the egg, followed by the orange zest and the molasses. Working at the lowest speed and taking great care to avoid a flour explosion, stir in the dry ingredients. Scrape the sides down and mix by hand as necessary. Adjust the dough to get a rollable consistency by adding juice from the zested oranges. Cover with plastic and refrigerate overnight. NOTE: This is the most advanced roll-and-cut cookie there is. Here are a few tricks we’ve developed: (A) The dough wants to be warm before you roll it out. I often squeeze it around in my hands first. (B) The dough will get dry and stiff on the second or third time through. Add some cream or OJ as needed. (C) The cookies are so thin they are hard to move. We cut a piece of parchment to size for the tray, roll the dough out on that with plastic wrap on top, cut everything to shape there, and then move the entire piece of parchment to the tray. Roll the dough on a sheet of parchment as described above. Now pull out the snowflake cutters and go nuts! Move the parchment to your cookie sheets when done. Bake at 325° for 9-10 minutes. Cool on the tray and then store in a cookie tin until decorating day. After all that work your cookies deserve to be a showpiece. They have a dark chocolate color so white (and/or tinted) royal icing makes a spectacular counterpoint. Highlight that with sanding sugar and silver dragees … and voila! We hang either these or Moravian Snowflakes from our tree every year and they are every bit as pretty as the “official” ornaments made from glass. NOTE: The royal icing can help to reinforce the cookies and make them less fragile. It only works if you pipe out lines, however. Dots are pretty but non-structural. NOTE 2: Every once in a while we notice moisture from the icing softening some cookies. 10 or 20 minutes of drying in a 200° oven will fix that. Don’t go higher, though, or the icing may start to brown. Feel free to substitute all or some with another spice. I like the combination of clove, orange, and cocoa. This entry was posted in cookies, disasters, Moravian Snowflake Cookies, personal experience, Thursday Morning Coffee Blog and tagged beautiful cookies, Christmas cookies, Moravian Snowflake Cookies, royal icing decorations, Thursday morning coffee. Bookmark the permalink. 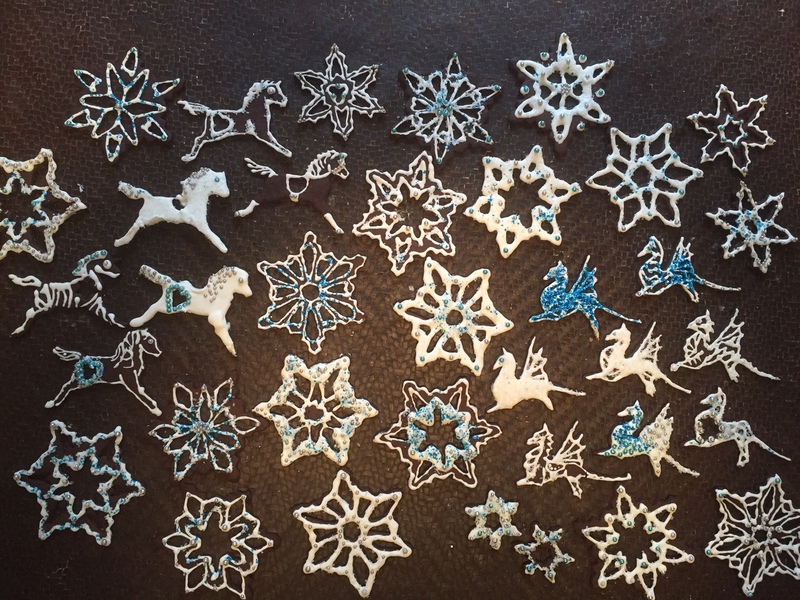 2 Responses to THURSDAY MORNING COFFEE – Snowflake Cookies, recipe included.